The original Bourne movie trilogy was smart, inventive, thrilling, and a massive boost for the ailing spy genre. It made an action hero of Matt Damon, featured action sequences that were fresh and exciting, and had an emotionally complex through-line that bolstered the already intense plotting. At the end of The Bourne Ultimatum, David Webb had gained the answers to questions that had plagued him ever since he’d been saved from a watery grave by the crew of a fishing boat. Except… he hasn’t, not really. The closing lines from The Bourne Ultimatum – “I remember. I remember everything.” – are repeated here at the movie’s beginning, and are followed by a montage of scenes from the original trilogy (as far as this movie is concerned, The Bourne Legacy (2012) never happened). But in amongst these memories are flashes of scenes we haven’t seen before. And when Jason Bourne snaps out of his reverie, we find him in the back of a truck and heading for an illegal fight ground in Greece. Clearly the years since he took down Treadstone and Blackbriar haven’t been good to him: despite his fighting prowess he still looks lost. And the bad dreams, or reveries, he’s experiencing aren’t helping. For someone who “remembers everything”, he’s having some of the most spectacularly disturbing and disorienting dreams ever. And he can’t make sense of them, especially the ones that involve his father, Richard Webb (Henry). Help comes in the familiar but unexpected form of ex-CIA analyst Nicky Parsons (Stiles). Having hacked into the CIA mainframe, she’s done so with the aim of helping Bourne learn more about his past, and has discovered that his father had a greater role in the Treadstone programme than Bourne has been led to believe. But in hacking the CIA, Nicky has become a target and her contacting Bourne in Athens leads to his getting “back in the game”. With CIA operatives on their trail, as well as an Asset (Cassel), Bourne gains access to the information Nicky hacked, and once he becomes aware of his father’s involvement, he finds his enrolment in the Treadstone program wasn’t as clear cut as he thought. But as before, his reappearance has senior members of the CIA, including Director Robert Dewey (Jones), unwilling to let Bourne expose their Black Ops programs. Using a combination of the Asset and the head of the Cyber Crimes Division, Heather Lee (Vikander), to track down Bourne and eliminate him once and for all, Dewey plots to keep the CIA’s secrets as hidden as ever. Fans of the Bourne Trilogy are generally dismissive of The Bourne Legacy, the Jeremy Renner starring addition to the series that failed to add anything new to the mix, and which felt like an uninspired retread of everything that had gone before. Matt Damon famously turned down the chance to cameo in Legacy, and made it clear that he wouldn’t return to the franchise unless Paul Greengrass was back on board as well. Well, Damon got his wish, and Greengrass is back as the movie’s director. But perhaps Damon should have made another stipulation: that Greengrass didn’t write the script. 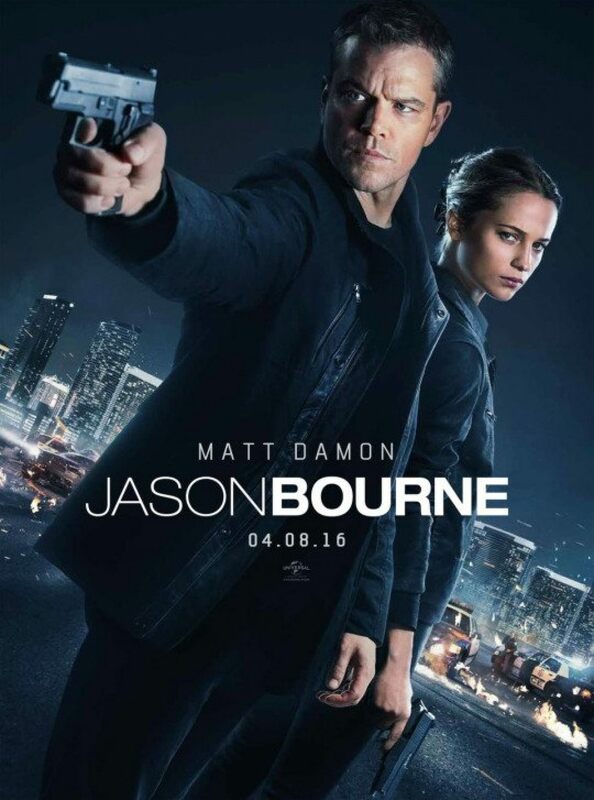 Jason Bourne has many of the same attributes that The Bourne Supremacy and The Bourne Ultimatum share. There’s the generous use of “shaky cam”, Christopher Rouse’s exemplary editing, excellent location work, and a series of intense and very well-staged action sequences (one of the series major strengths). But there’s one aspect that’s missing this time round, and aside from Greengrass’s muscular directorial style, it’s perhaps the series’ most important component: the contribution of Tony Gilroy. As screenwriter of the first two movies, and co-screenwriter of the third (though his input was drastically reduced), as well as Legacy‘s writer/director, Gilroy helped guide the series from its inauspicious beginnings to a position of critical and commercial success worldwide. His scripts had intelligence, depth and subtlety, and his villains were drawn with a vividness and care that made them worthy adversaries. But without Gilroy (no doubt a casualty of The Bourne Legacy‘s poor reception), Jason Bourne proves just as disappointing as its unacknowledged predecessor. Nearly ten years on from the events of Ultimatum, Bourne is still an emotional mess, haunted by memory fragments that cause him pain and regret. He looks awful, and Damon plays him like a man besieged. 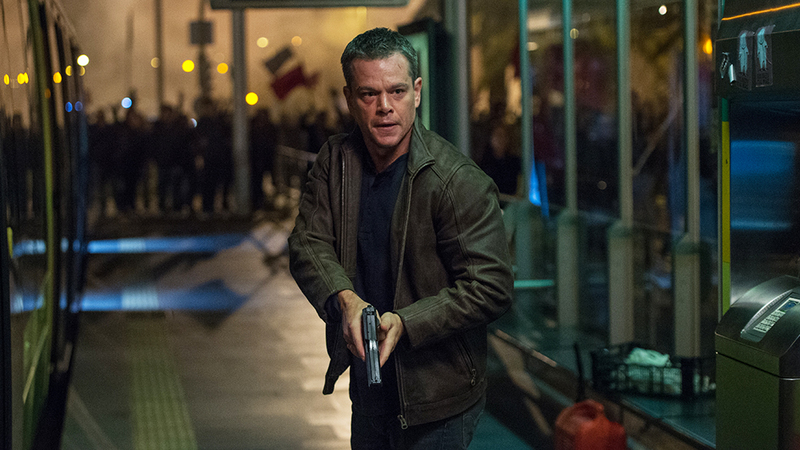 For a man who found all the answers he needed, Bourne looks even more tormented than when he was in the dark. The movie never really attempts to explain why this is the case, preferring instead to give audiences a tortured Bourne without expanding on his back story. As a result, his decision to jump back in, prompted by some spurious nonsense involving his father, seems perfunctory instead of necessary. With Bourne himself treated in such a cavalier fashion – he’s really just a one-man wrecking crew here – the other characters fare just as badly. Dewey is a stock villain, one step removed from twirling an invisible moustache and muttering “mwah-ha-ha!” whenever the script has him do something nefarious. Jones has no chance with the role, and there are times when his awareness of this comes through loud and clear; just watch his scenes with Vikander, and ask yourself if he looks committed. Cassel’s Asset is fuelled by revenge for the torture he suffered through Bourne’s exposure of the Blackbriar program, but as the character spends an inordinate amount of time running around chasing Bourne without actually catching him, his anger (and his back story) gets shoved to the side. And then there’s Heather Lee, the Cyber Crimes head who acts as this movie’s Pamela Landy. There’s supposed to be some mystery as to which side she’s on (she helps Bourne in various ways while pushing a separate CIA agenda), but thanks to Greengrass’s less than subtle direction, Vikander never looks anything other than extremely distrustful. And then there’s the small but important matter of how Bourne gets about. From Greece he travels to Berlin, then to London. He does so on his own, without any help from anyone, and manages to elude detection at every turn (a facet of the series that was usually, and very cleverly explained away – but not here). And yet when he travels from London to Las Vegas he does so by commercial aircraft, and though he receives assistance from Lee in getting through US Customs, it still begs the question how UK Customs didn’t flag him up in the first place. (Also, it seems that outside of Athens and Las Vegas there’s not the CCTV infrastructure to allow the CIA to track Bourne efficiently anywhere else.) And stop and think about this: in Las Vegas, at an expo for a communications platform that Dewey wants to appropriate – don’t ask – Bourne picks up various conveniently placed bugging devices that he uses to get to Dewey, all of which begs the question, what plan did he have originally (as he couldn’t have known they were there beforehand)? Gaping plot holes like these only add to the realisation that Jason Bourne is a less than rewarding, less than necessary sequel to four previous movies (three of which had already told the story effectively and with impressive style), that throws in a handful of rousing action sequences, makes Bourne indestructible, has a subplot involving a communications platform – actually, still don’t ask – and features some of the blandest characters in the whole series. Greengrass is a mercurial director, with a great visual style, but he’s not as good a screenwriter as he might think, and along with Rouse, he makes things too simplistic for the movie’s own good. The end result? A movie that only takes off when it’s throwing punches or chasing SWAT vehicles. 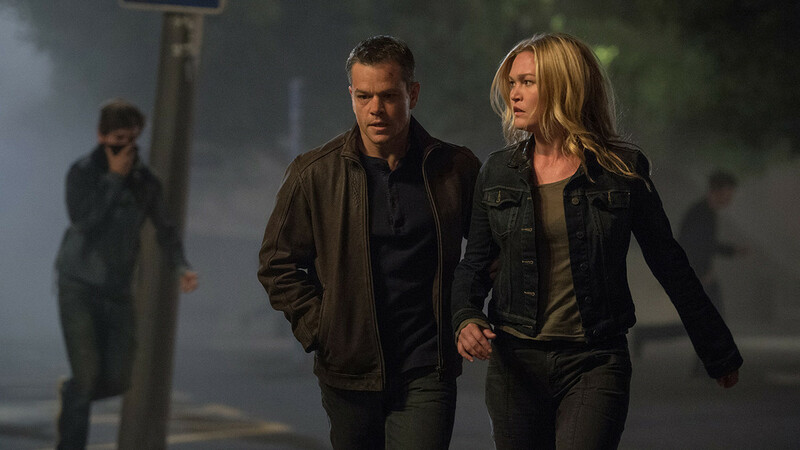 Rating: 5/10 – a missed opportunity to enhance and expand on the series, Jason Bourne trades on nostalgia instead of bringing something new to the franchise; Bourne looks tired throughout, as does Jones, and by the movie’s end the viewer will feel exactly the same way.